I admit that I probably wouldn't have tackled THE DOVEKEEPERS by Alice Hoffman had it not been a book that my on-line book club chose to read. It's a historical fiction book set in ancient Israel in 70 C.E. that tells the story of four unique women who are living in the Judean desert Masada as the Romans massacre their tribe, and it did sound interesting to me. But it's also pretty intimidating at over 500 pages. I tend to shy away from big books lately and I was also hearing from some of my blogging friends (Sandy and Kathy) that it wasn't exactly an easy read. Nonetheless, a few days prior to our scheduled book club meeting, I decided to tackle THE DOVEKEEPERS. Unfortunately, I wasn't able to meet with my friends to discuss THE DOVEKEEPERS, but I don't regret having read it. Having said that, I still don't think I would have picked up this book if I hadn't had to read it; however, now I am glad that I stuck with it. 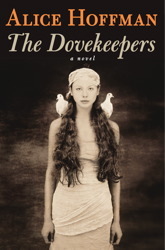 I didn't love THE DOVEKEEPERS, but I did enjoy it; and there were many things that I appreciated about this novel. And I do think I enjoyed it more than some members of my on-line book club! It's been a few weeks since I've finished THE DOVEKEEPERS and the book has still remained in my thoughts. For the most part, that's a good thing because it shows that the story and the characters are memorable; however, in the case of this novel, it's also a negative aspect. One of the things that pops into my head when I reflect on THE DOVEKEEPERS is that it was entirely too long. This book felt like a 500 page book, if that makes any sense. Maybe it's because I don't read many chunksters anymore, but this novel wasn't an easy read for me. The book contained some very detailed descriptions, as well as some flowery prose; and I thought there were many, many scenes that could have been cut or shortened. I hesitate to even say bring this up because who am I to question Ms. Hoffman;s writing style, but it is one of the things I remember most about this novel, so I'm just putting it out there. So apart from my issues with the length of the novel and the detailed prose, I did enjoy THE DOVEKEEPERS. I thought the premise of this novel was so original, and I found the story of the Jews at Masada to be fascinating. While I had heard of Masada, I definitely wasn't familiar with the details of the Jews' plight; and I appreciated that this book brought that story to my attention. I have read that this book was five years in the making, and I absolutely believe that. I can only begin to imagine the amount of research Ms. Hoffman conducted while writing this novel, and I do think she managed to capture the essence of the time period. THE DOVEKEEPERS is divided into four sections -- one for each of the four main female characters; and I appreciated how the story was told. Of course, there were women whose stories resonated with me more than others, but I found all of them to be interesting in their own right. I enjoyed hearing their stories in their own words, and I felt as if I got to know and understand each of the women. Furthermore, I liked seeing how the different actions were interpreted by each character, and I especially enjoyed reading about those times when their stories crossed. What I most enjoyed was how Ms. Hoffman managed to unravel secrets about each character through the use of another character's story. I thought she did an excellent job of telling each woman's individual story while also managing to make the novel a cohesive unit. Another very interesting aspect of THE DOVEKEEPERS was how Ms. Hoffman incorporated the spiritual and mystical aspects of the culture into the story. The women in this novel received messages in their dreams, interpreted signs and even saw some ghosts; and usually, I'm not a big fan of books that include these types of things. However, these items seemed to belong in this story and I think the author used them to effectively tell these women's stories. THE DOVEKEEPERS is a good choice for book clubs (as long as your group is up to reading a 500 page novel!) This novel is an extremely ambitious effort and it does cover many universal themes. There is a reading guide available with fourteen thought-provoking questions, and I actually found many of them to be extremely interesting. In addition to discussing each women's character, you can also choose to focus on themes including friendship, the role of women, parent/child relationships, love, faith, war, mysticism, and devotion. I can't say that I loved THE DOVEKEEPERS, but I did enjoy it and I'm very glad that I read it. I don't think this book is for everyone, but it is an interesting look at the people of ancient Israel and the Masada massacre. I received an ARC of this novel at the 2011 BEA. I've seen mixed reviews for this. I'm glad you enjoyed it even if you didn't make the book club meeting. You liked this one more than I did. I thought it was too long too, and the voices of all the characters felt the same to me. I feel like a lot of her books have had mixed reviews when they'd caught my attention. One of these days I'll try her stuff for myself but maybe not this one. I love the cover so I was instantly attracted to this book. I do like books that are separated into parts and weave history throughout fiction. Plus, I just love Hoffman. Does she have any magic in this one? I don't know if I'd call it magic in the sense of her other novels, but there are some mythical elements.